I am just writing to say a huge big thank you to all of a you for helping my twin daughters J and S.
My daughters are both mentally handicapped with a speech and communication disorder. They are almost 8 years old and cannot read or write. They have poor speech, which is not very well understood. They cannot dress themselves without support and cannot get the correct shoes on the correct feet. Their attention and concentration is also poor and both girls are easily distracted. Their disability is a hidden one as to the world they look the same as any mainstream child on first glance, as there are no obvious signs of disability. When we first came to the RDA Sessions, neither of my daughters could string any words together. They both tripped over a lot and were very clumsy. I can remember their first session with huge fondness. That evening over a period of 5 or 10 minutes, J said ‘more riding’ and S said ‘more riding please’. I was ecstatic and could not believe that one session could have resulted in the wonderful words that were spoken. As the sessions progressed, both girls achieved their RDA Grades 1 and 2 Riding and Stable Management and then Grade 3 Riding. The progress that both girls made in learning the parts of the horse and the tack have been tremendous. The girls have both failed to make progress at school, and yet have learned complicated words, different colours of horses, hoof pick, body brush, curry comb etc. The RDA has tackled colours, numbers, matching cards, left and right and most of all having a great time. When my daughters started, they had 2 helpers each, they have progressed to one helper, then onto a leader only and over the past few weeks, Lucy has encouraged the girls to be in control of their own ponies. They have had ‘races’ with each other and have had such great fun. Both girls sit very nicely and have mastered rising trot fantastically well. RDA has helped my daughters in so many ways and it is such a shame that they cannot tell you themselves. Riding has helped their self esteem, co-ordination, knowledge of colours, matching abilities and above all else, improved their speech and communication. They are able to concentrate for longer than they did when we first started. They now have more appreciation of left and right, although the pony doesn’t always go the right way! 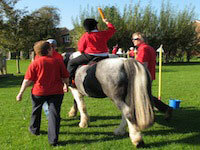 RDA helps with so many aspects of a child’s disability whether this is a mental or physical one. This facility is worth a million pounds and has enriched the lives of my 2 daughters more than I would ever have thought possible. My last words are a great big THANK YOU to yourself and all the helpers from S, J, my husband and myself.